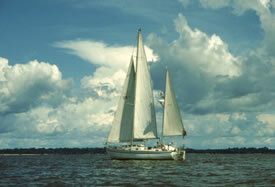 Buy A Family Outing A Family Outing in the Atlantic tells the story of a sailing voyage which began at the time when Jill first met her husband to be. It ended, seven years later, with a disastrous capsize off the Falkland Islands. Nick and Jill set out from England, in Nick's tired old cruising yacht, with the ambition of entering the Pacific by way of Cape Horn - but they never quite reached their destination. When their plans were not being thwarted by ill fate they were introducing their own diversions and detours, with the result that their journey was more like the haphazard outing of the bumble bee than the purposeful expedition of the crow. Settling into the cruising life can take some time, especially if the weather is bad. On their first long passage they suffered a severe gale which did quite a lot of damage and made Jill very sick, so that she was on the point of throwing in the towel. Stretched out on the pilot berth in the main cabin I listened to Maamari crashing through the waves, and with each rise and fall of the boat I felt my stomach lurch. My back sagged into the slack lee-cloth, set up to stop me from rolling out of the bunk and onto the floor, and my head lolled uncomfortably against the wooden rim of the cot. For the past four hours and more I had lain here, shifting my body from side to side as I searched in vain for the luxury of my familiar bed. But that bed was now many hundreds of miles away. Oh, for some respite from the unceasing motion, the continual bucking and plunging and crashing. I opened my eyes. The cold, grey light of early dawn had already seeped into the cabin and I knew that it must be after six o’ clock. Feelings of dismay washed over me; Monday morning feelings exactly like those I used to know as a child, when I woke with the dread of going to school. As Nick dropped down into the cabin I closed my eyes again, but there was no escaping it. Another hour of tossing and turning would not bring me the sleep I sought. And besides that, it was my turn to take the watch. The skipper peered in at me. “Happy Christmas”, he said, with what seemed to me to be quite inappropriate good cheer. Yes, it was December 25th. And here we were, the two of us, crashing about in a gale. This was not the life I had dreamt of when we set off to go cruising. Struggling out of the bunk I was hit by a wave of nausea and had to grab for an empty saucepan. On reaching safe harbour they fell in with a crowd of others who had come through the same adventure, and the companionship of these fellow rovers was the tonic that set the author on her feet again. The couple continued their odyssey, and the reader of A Family Outing travels with them as they meander along, through fair weather and foul, over the ocean and up rivers. He journeys along the Amazon, where Jill and Nick got married, and follows them to the Caribbean and to Antigua, where they stopped to earn some money and added two kids to the crew. Caesar seemed to have taken to the water like the proverbial duck. Sailing was in his blood, we decided. 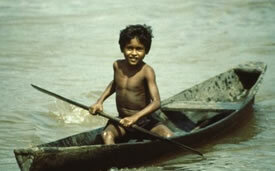 Often, while we were in harbour, he played make believe sailing games. “Look out, Xoë!” he would cry as he hauled on the genoa sheet. “Caesar tacking! Mind your fingers!” Sand, sun and splashing in the surf were also pursuits much favoured by the little fellow, and he was never happier than when ambling about on a beach. Off Anguilla’s northern shore lies Sandy Island, a tiny, uninhabited place whose name says it all. Here we spent many an enjoyable hour - it was plain that Caesar loved the place - but when, at length, we dragged him away and he voiced his displeasure with the wandering life we assumed that this would be a very temporary set-back. How wrong we were. 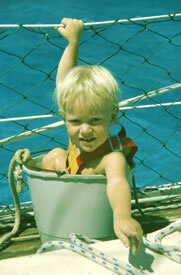 On our third day at sea our little lad announced, “Caesar not like sailing”, and he gathered up his bucket and spade. “Going ashore” he said resolutely. Alas, there was nothing but water all around us and so the poor chap had to be content with building a pretend castle on the carpet, which was no fun at all. When, after seven days, we finally sighted the island of Grand Turk, Caesar steadfastly refused to come on deck. It was as if he had given up all hope of ever seeing land again. However, on hearing the anchor go out he was up the ladder in an instant. The sight of a beach close by sent him below decks again - but only to fetch his bucket and spade. 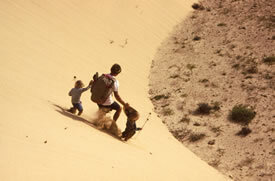 The family sailed back across the Atlantic while the children were both still in nappies - that was an experience that Jill will never forget - and then they spent two years exploring the Cape Verdes and the West African coast, searching for hippopotami but finding only sharks and crocodiles. Their two fair-headed toddlers were a big hit in that part of the world. From Ghana they made a thoroughly enjoyable seven week crossing to Uruguay, and thence they travelled south - and met with disaster. But she must be. My mind was completely blank. It absolutely refused to accept the possibility that my little girl could simply disappear as if she had never existed. I seemed to hear a little squeak. I must have imagined it. We were calling her name - helplessly, stupidly - but there was no reply. We were just standing here, doing nothing, when there ought to be action - but what action? Then we heard a little gasp. We both heard it. It came from the rubble in the bilge. How could she be in amongst that lot, which Nick had only just replaced after our previous capsize? I scrabbled at the pile of junk and found Xoë’s little face, peering up at me with an expression of horror and shock. Besides the junk, she was up to her nostrils in water. She can have had no idea where she was. All those cans of paint and shackles and screws had flown out, and Xoë had somehow tumbled in before their return. In her trajectory from the passageway across the deckhead she must have missed the companion way by only inches. And had she fallen into the locker headfirst, and then been buried in the same way, we would never have found her. Why should we have thought to look under what seemed like undisturbed stores? Imagine the awful horror of finding her hours later...! But no, try not to imagine anything, except our survival. Get her back into the passage and hug her tight. Then set about saving the boat. This time there was no surprise or chagrin. Compared to the loss of our main hatch, the loss of the rig was of no consequence. Now we knew that we were fighting for our lives. With all these hatches gone another knock-down would surely sink us. 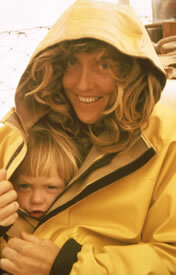 The story of the Schinas family's capsize off the Falklands was widely covered in the press, partly because it involved two small children but largely because they were hauled to safety by the RAF. 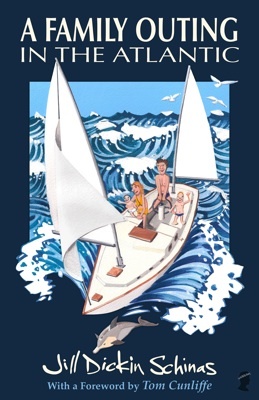 Besides appealing to armchair adventurers A Family Outing in the Atlantic will also be of great interest to would-be cruisers as there is a lot of practical information and advice carefully worked into the tale. It is a travelogue, but it is also a portrait of The Cruising Lifestyle. 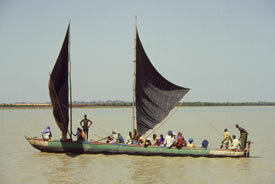 The manuscript also contains quite a bit of information about sailing in West Africa, and since Nick and Jill Schinas were amongst the first yotties to cruise south of Guinea Bissau this could be said to be seminal. In Ghana, where the family was the centre of much attention, they were told that theirs was only the second yacht ever to visit the country. This makes clear the difference between cruising on the so-called “milk run” - the usual round the world route - and travelling off the beaten track. One or two of the places that the Schinas family sailed to in Guinea Bissau were genuinely uncharted and had to be surveyed with lead line and compass. A Family Outing in the Atlantic is available from all good bookshops, including online ones such as Amazon UK and Amazon US.